Maybe tomorrow. Maybe tomorrow you’ll go snorkeling to find freshwater cichlids in the calm, clear water. Maybe tomorrow you’ll steer a little Laser One dinghy into international waters. Maybe tomorrow you’ll cross the rickety wooden bridge for a grape-seed oil massage on the rock island spa. Or maybe tomorrow you’ll walk around the whole island to see its massive cathedral, small textile workshops, and huge baobabs. But not yet. Today you have no plans. You just arrived on Likoma Island. It took flights to Nairobi, Lilongwe, and, finally, Likoma to reach the island. A bumpy, four-wheel-drive ride on dusty, unpaved roads then brought you down to the southern coast and Kaya Mawa. The small resort instantly took your breath away. Eleven free-standing chalets, an open-air restaurant, and a terrace bar overlook golden sand, tiny rock islands, and crystal water. Your plans immediately disappear. All you want to do is stare at this picture-perfect view. The resort’s name gives you permission to do so. Kaya Mawa means Maybe Tomorrow. It’s almost as if you’re expected to do, well, nothing once you arrive at the luxury resort. Its individually designed chalets sit on rocky knolls. You debated between Nhkwazi, for its extensive outdoor space, and Makungulu, since it’s on its own private island, before deciding upon Mbamba. The hilltop, premium room offers 360-degree views from both its bed and private plunge pool. You’ve already requested sundowners to be delivered around 5 pm, right before the sun sets. The bar and the restaurant sit below the chalets. Lanterns, colorful patterns, and plush pillows are spread around the bar’s split-level decks and comfy couches. Light breakfasts, lazy lunches, and multi-course dinners feature organic produce, hand-picked herbs, and freshly caught lake fish. Though there are tables in the restaurant, many meals spill onto the decks and the sand, which is lined with torches at night. Kaya Mawa keeps getting better and better. 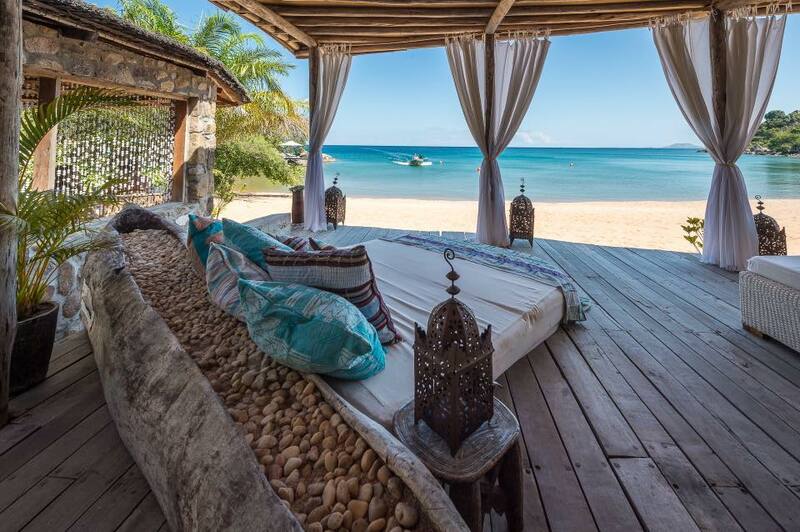 Kaya Mawa is on Likoma Island, one of two Malawian islands that sit in Mozambican waters in Lake Malawi. Likoma and its smaller sister island, Chizumulu, were colonized by Anglican missionaries in the 19th century. That’s why they were considered part of Malawi, instead of Portuguese-colonized Mozambique, when East African borders were established after World War II. Likoma Island is home to St. Peter’s Cathedral. The huge cathedral—it’s one of the largest churches in Africa—was built atop Chipyela, where suspected witches used to be executed. There are a busy market and a small airport, occupied by more goats than planes, as well. The rest of the island has remained unspoiled. 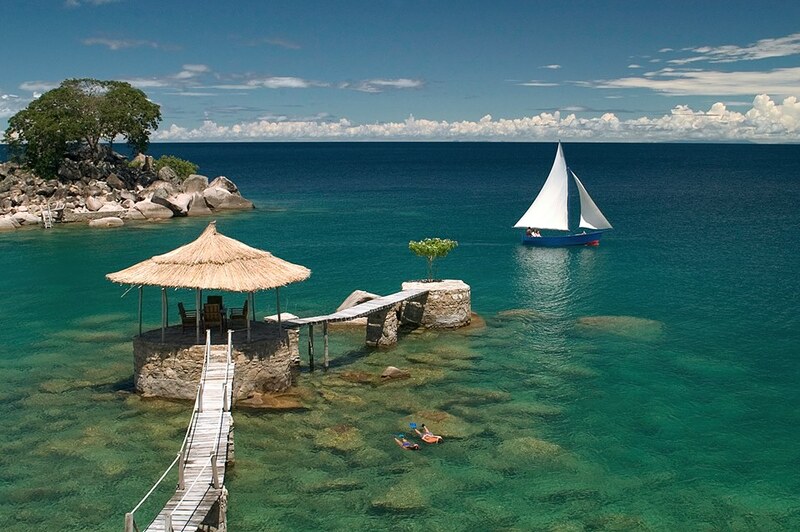 Lake Malawi is one of the largest lakes in the world. The African Great Lake, nicknamed the Calendar Lake for its length, is the third-largest and second-deepest lake in Africa. The meromictic lake, whose water layers don’t mix, lies between Malawi, Mozambique, and Tanzania. Plus more than 700 species of cichlids—more species than any other lake in the world—have been found in these waters. So, yes, there’s plenty for you to explore. Maybe tomorrow.